This Saturday South Adelaide head to Gliderol Stadium to battle the Bays in a clash of coastal rivals for the Carey-Darley Cup. Adult $14, Concession $8, Under-18s FREE. The Panthers are looking to close out a three-game road trip with a victory against the Tigers. A win would give them a 2-1 record over this span after breaking their away hoodoo against Norwood at the Parade last weekend. Victory over the Bays will be key in a week that could shake up the SANFL IGA ladder. With league leaders Sturt facing fourth-placed Adelaide, a win for third-placed South could see them go equal first on points (if Adelaide win) or a further game clear of fourth (if Sturt win). Meanwhile, if plucky North can take a game from the Woodville-West Torrens, a Panthers victory would see them leapfrog the Eagles into at least second. For a full breakdown of the Panthers/Tigers match-up check out this week's match preview here. 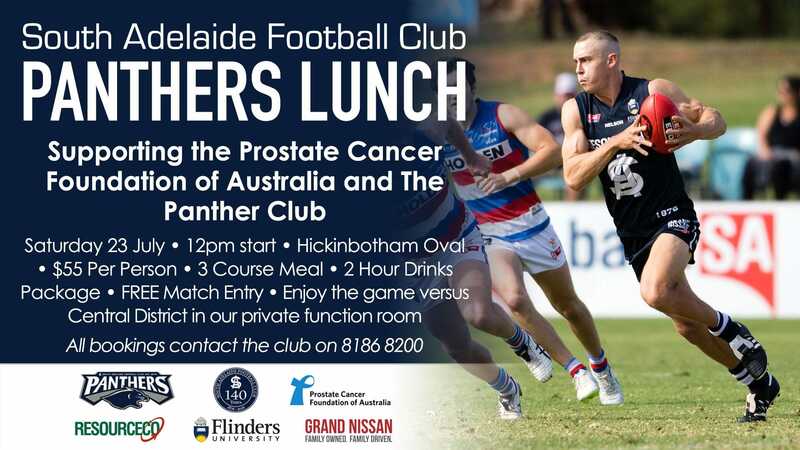 In the traditional coastal rivalry with the Tigers, the Panthers will be looking to keep control of the Carey-Darley Cup, which honours the contribution to football of superstar ruckmen Peter Carey and Peter Darley. South Adelaide are looking to extend their hold over the Cup to six years and their total record in Cup games to 17-9 since its inception in 1992. However, before South can start thinking about claiming Cups or jostling for ladder position, they must head to Brighton Road and get the job done against a Glenelg side that is coming off the bye and a disappointing loss to West Adelaide and will be eager to halt a three-game losing streak. The Panthers could again head into this week's clash unchanged, with Brad Gotch and his selection committee's only moves adding hard running midfielder Richard Newell and Encounter Bay product Ben Heaslip. Young forward Codey Ellison has held his place in the side after being a late inclusion for Ben Haren (calf) to face the Norwood. The athletic former Reynella Winefly worked his way into the game against the Redlegs and impressed many with his marking and two late goals. Haren headlines a pair of ins for the Reserves, with Cameron Hitchcock also joining the big forward in Adam Blakely's attacking line, after recovering from a hamstring injury suffered against North Adelaide in Round 10. Unfortunately, the Reserves will be without the services of big-bodied defender Ben Darrou and youngster Scott O'Shaughnessy, who have been forced to the sidelines with injury. Rounding out a three-game stretch of away games and with valuable ladder position up for grabs, the boys need your support more than ever! Make sure you get to Gliderol Stadium this Saturday and get behind the team! If you cannot make it to the Bay on the weekend download the SAFC App for live scores, stats and radio call of the game! The SAFC App is available for free download from both the App Store and Google Play.